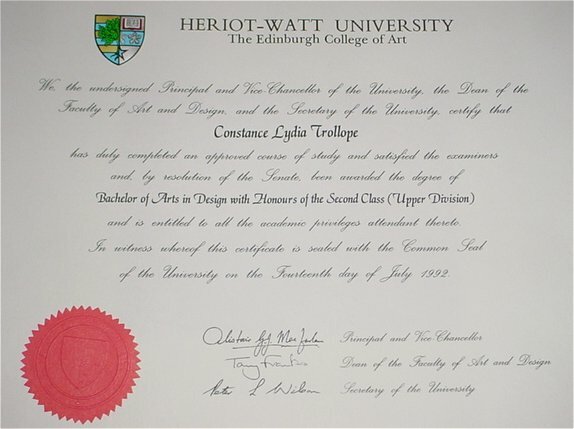 Certificate of Studies - Bachelor of Arts in Design Degree. 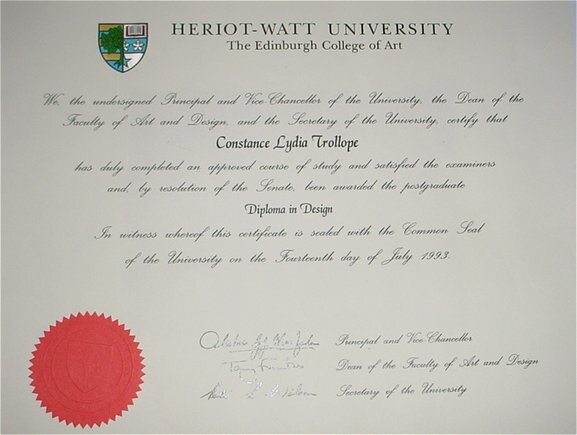 Certificate of Studies - Diploma in Design. 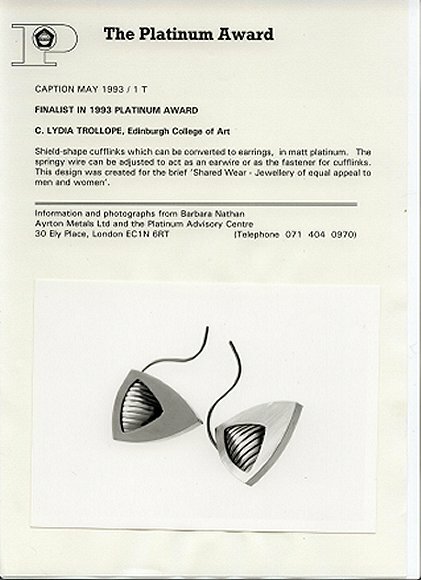 Winning Design Drawing - Platinum Awards - Finalist 1993. 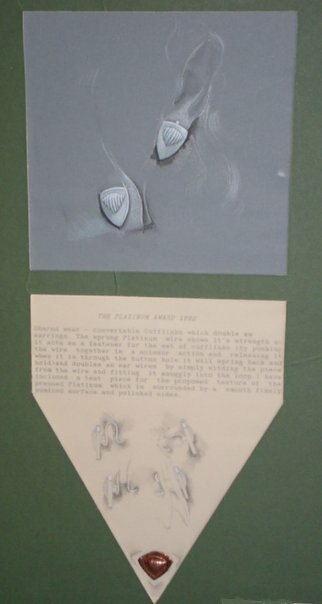 This design for duel Cufflinks/Earrings reached the top 10. Therefore I had the oppurtunity to make the finished design from Platinum. This metal is very difficult to work with. The metal had to be folded over and over to acheive the effect seen below in the finished photogragh, unfortunatley air bubbles keep appearing between the folds. But I managed it ! Great fun! This design drawing was for a pair of Earrings which could be worn during the day and be converted into something glamorous for the evening. Made from 18ct Gold, Diamonds and Rubies. I am the first person in Scotland ever to win this award. 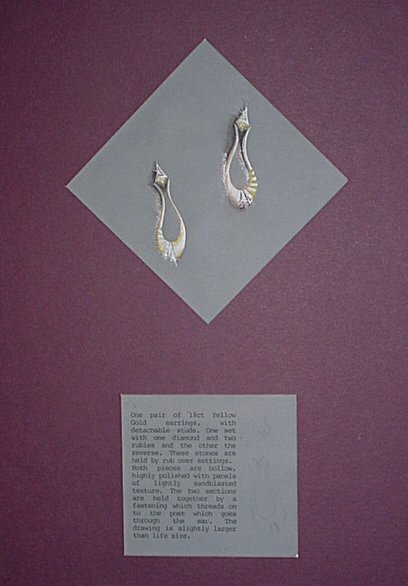 I was given the materials and had to make the finished pieces, which were exhibited in the Worshipful Company of Goldsmiths in London. These were only worn once - on my wedding day! 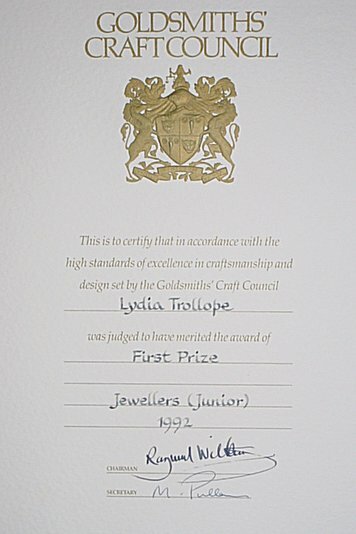 Certificate - Worshipful Company of Goldsmiths Award 1993.